Shimadzu's simple design enables both first-time users and daily users to perform operations with confidence. Automatically determines the quality of the spectrum. Provides strong support for quality control operations. 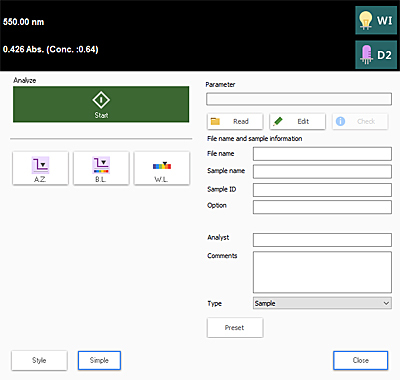 Automatically outputs text file and transfers data to Excel®. 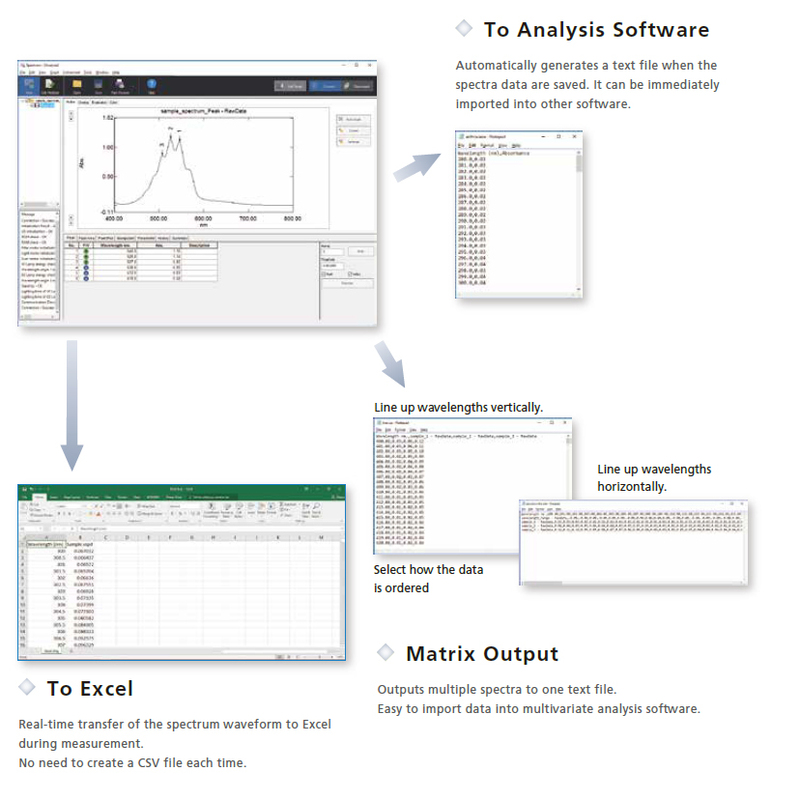 Easy to analyze measurement data with other applications. From the start, the software's user-friendliness allows users to perform operations with ease. With extensive features, LabSolutions UV-Vis meets a wide range of users' expectations. It permits four measurement modes: spectrum, quantitative, photometric, and time course. 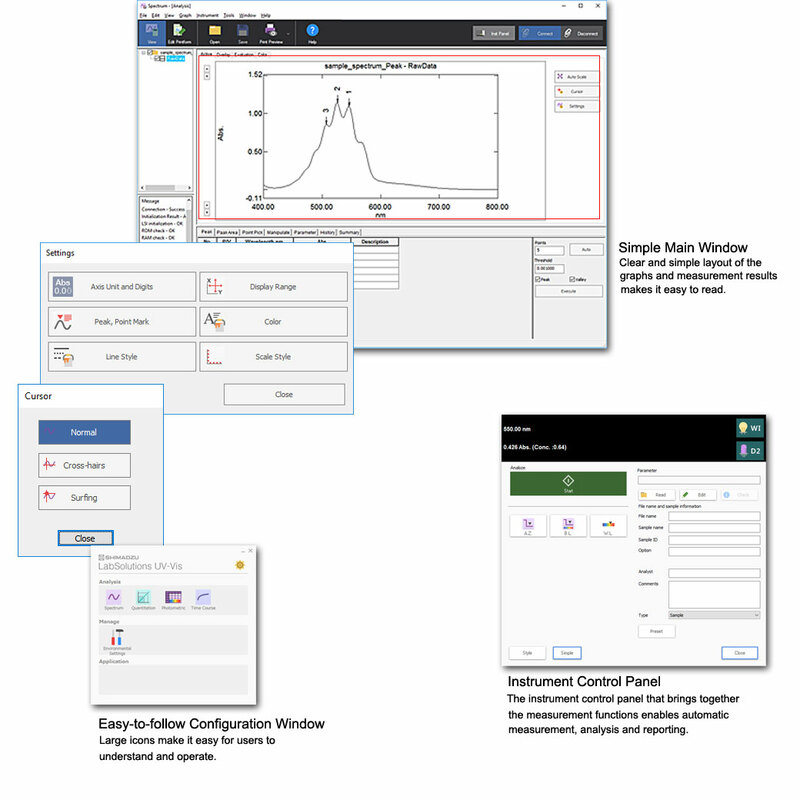 Users can open multiple measurement modes at the same time, so that data analysis can be performed in one mode while collecting data in another mode. 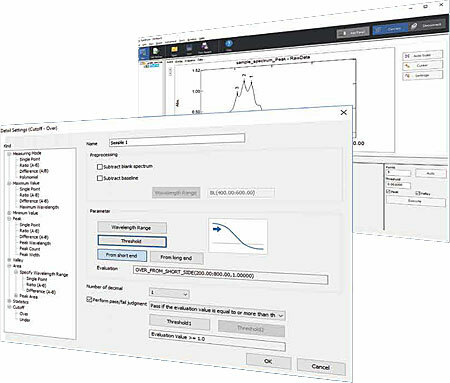 Post-measurement correction of waveform, peak detection, and printing can be done automatically. Sample names to analyze are collected and read from a CSV file in advance. 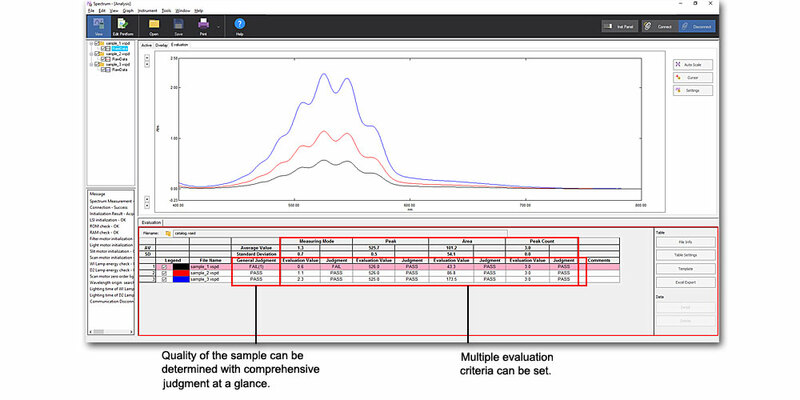 In quantitative measurement and photometric measurement, samples to be re-measured can be set up with ease. Horizontal axis of the spectral graph can be set to wavelength, wavenumber or energy. Fine adjustments can be made with one click on the graph scale. Graphs can be easily pasted into other applications as bitmap images. In addition to providing measurement and analysis results, judgment results are also provided. 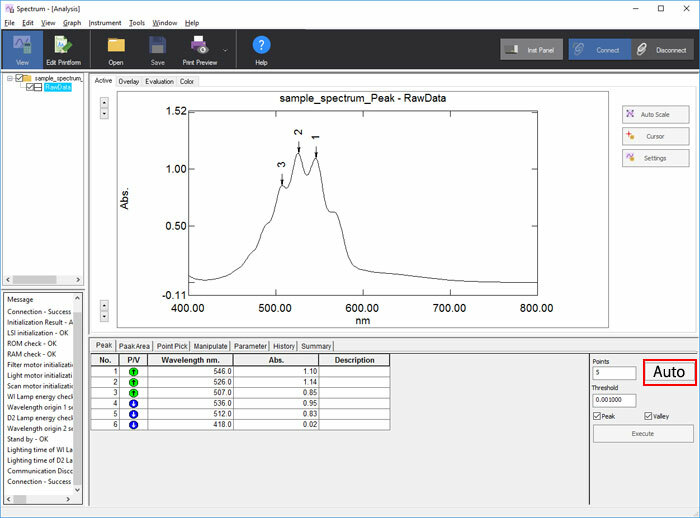 With this feature, LabSolutions UV-Vis enables users to maintain a product's quality. 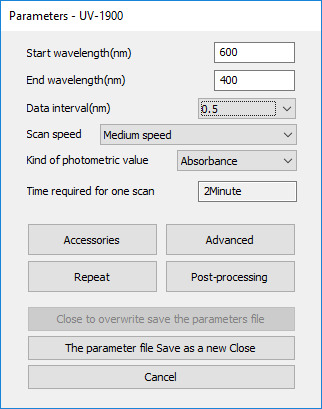 Evaluation conditions can be saved to a file. Operations from measurement to judgement can be performed automatically. Evaluation results report can be printed with one click. Peak exists in the 270 to 280 nm range. Peak does not exist in the range > 320 nm. Only one peak exists in the 260 to 300 nm range. The peak intensity is > 0.45 Abs. The first wavelength is < 550 nm when transmittance exceeds 50%. Maximum transmittance below 400 nm is < 1.0 %. Minimum transmittance above 550 nm is > 80.0 %. Average transmittance above 550 nm is > 85.0 %. 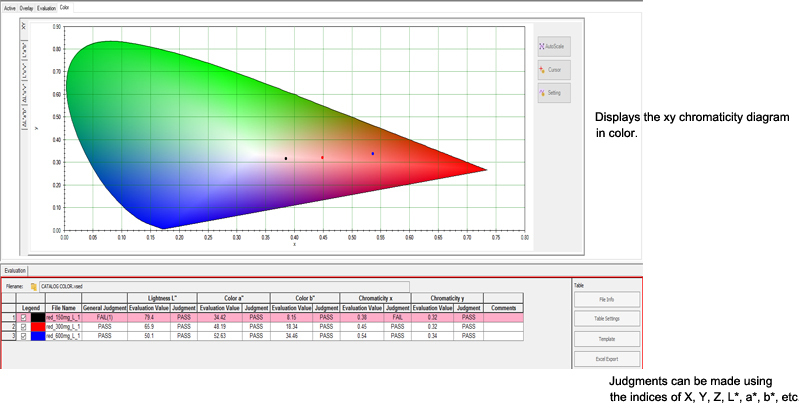 Color calculation can be added to evaluation function. 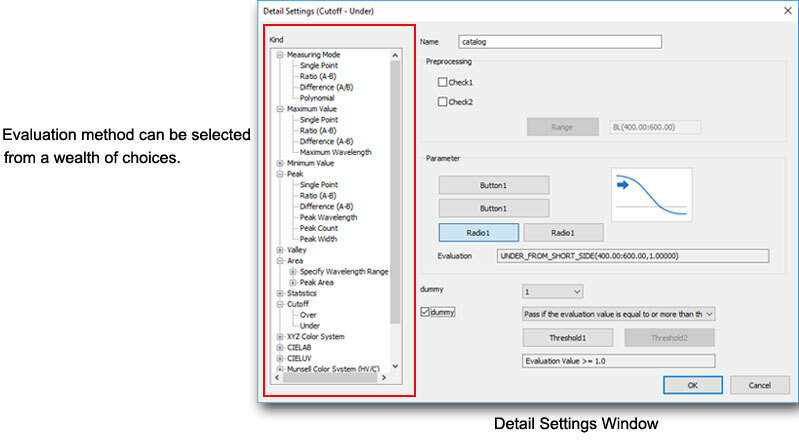 In addition to JIS, ISO compatible calculations can be performed. and import for analysis in other software, such as Excel. LabSolutions is a trademark of Shimadzu Corporation. Excel is either registered trademarks or trademarks of Microsoft Corp. in the United States and/or other countries.